The word “Dachshund” comes from a German word that means badger dog. They are similar to the terrier group of dogs due to the behavior that it exhibits. There are three types of dachshund: short-haired, long-haired, and wire-haired. They have a life span of 14-17 years. 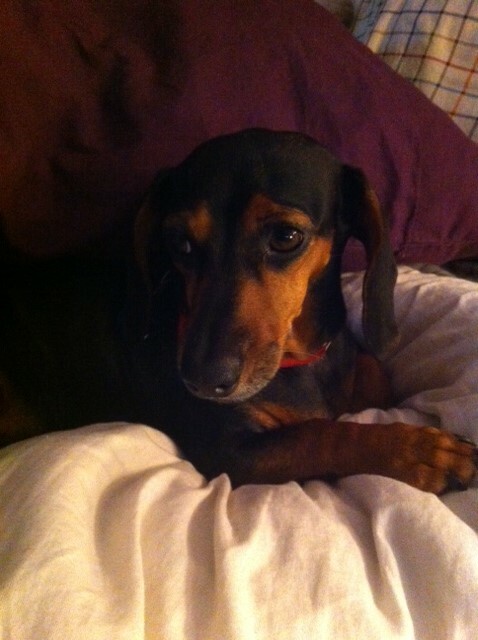 As of 2012, Dachshund is the 10th most popular dog in the U.S. (AKC Dog Registration Statistics). I do not have a picture during the time that Weston went to the vet yesterday. My parents took him and their dog to the vet together because I was working. He has waited too long to have his yearly shots. Anyways, I was told that he waited in the car (it was running with the A/C on) while their dog was being examined. When my mother went back out to the car (she didn’t take very long and you can see the car through the glass window of the vet), she found the windshield wipers were going and he has pushed a bunch of buttons on the door, causing the windows to go up and down, and locked himself in. LOL. Scared my mother to death that he locked himself in the car, but with luck, the window was down a little where she can stick her arm inside to unlock it…whew. He was crying with a strange sound they told me. Ugh. He is very mischievous… What a dog. “Weston” is my lazy dog and this is how I feel today.